With a mean shoe collection to envy and effortless girly style, Brittany from Pockets & Bows was the perfect girl to feature this month. This 24-year-old southern belle from Tennessee, knows a thing or two (or three) about style. Brittany's fearless personal style combines high and low pieces to create glamorous looks that are right on trend. I would describe my personal style as classic with a trendy twist. Oh and I can't leave the house without a mean shoe! I shop EVERYWHERE. Right now I'm loving Zara, H&M, and ASOS the most. I'm stalking that website like everyday. 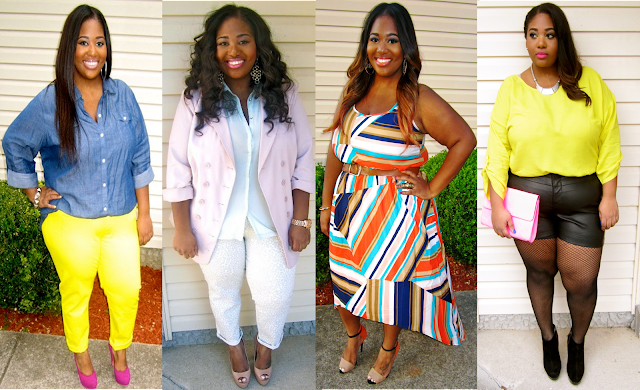 A fatshionista is someone who has established their own style and non-wavering. Someone who can wear just about anything with confidence and gets the fashion wheels turning in everyone's head. My advice to my fellow plus size ladies is to wear, walk, and wow with confidence! Many plus size ladies feel that they can't get away with certain styles or trends for fear that others will look down on them, but you can make anything work for you and also make it look tasteful. Remember, confidence is convincing. I get fashion inspiration from Fashion Shows, Blogs, and Street Style. My best beauty secret is water. Believe it or not, just plain ol' H20 is the best moisture agent, inside and out. My blog name came about in 2009 at a time where I was obsessed with anything with pockets or bows, so my best friend told me that I should call my blog that, and the rest is history. My favorite piece in my wardrobe would have to be my Zara color block sandals. I wear them with everything. What's a trend you predict this summer? This summer will be all about the classic bare sandal! (Similar to my Zara color block heels). Celebrities have already caught and it's slowly making its way on to feet of the everyday woman. her style is so cayute...thanks for sharing! Perfeitaaa.. Ela se veste muito bem!! E é uma inspiração pra meninas plus size aqui no Brasil!! Great post. She is fly and I am now following. Thanks Mia! She has really cute style!!! She has a great style, and we have the same body type! I'm going to her site to snag more inspiration! Thank you!